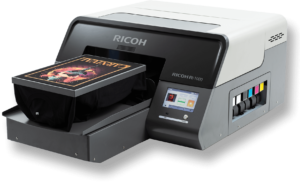 The newest DTG printer from Ricoh, the Ri 1000, offers high-performance features at an affordable price for users ready to launch or grow their garment printing business. It delivers incredible flexibility and image quality in an affordable, easy-to-use package, perfect for both new and experienced users. The Ricoh Ri 1000 prints full colour graphics at 1200x1200dpi on garments of a diverse array of sizes, colours and materials. Quick-change magnetic platens, available in multiple styles and sizes up to 16×19.6in, provide a variety of print options. These platens easily snap on and off the machine, so switching between different garment styles and sizes requires virtually no downtime. All Ricoh Ri 1000 platens are dressable, which provides hassle free loading, precision printing and garment protection. Additionally, the Ricoh Ri 1000 boasts durable steel construction, including a Ricoh-designed high-performance print engine and Ricoh print heads. The printer’s specialised carriage and table design help deliver high-accuracy images, even while printing at speeds up to 28 seconds for a full-colour, 10x8in CMYK graphic. 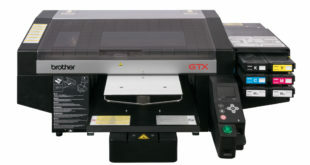 The Ricoh Ri 1000 was designed with walk-up ready ease of use in mind. Automated maintenance sequences clean print heads and agitate white ink regularly, saving operators time and making the device easier to use and maintain. The Ricoh Ri 1000 continuously monitors its ink supply, air level and dampers, adjusting where necessary so it is virtually always ready to print. For those maintenance tasks that aren’t automated, the device’s 7in touch screen display includes a built-in Interactive Operation Guide, which provides alerts reminding users to perform manual maintenance tasks. This touch screen also allows for intuitive job and workflow management. This printer will become available from Resolute DTG in the New Year and will be on display at Printwear & Promotion LIVE! in January.